An interesting and informative series of newsletters from the Oblates in Iquitos, Peru, is now available on the Spanish section of this website. The Oblates are working in the Parish of Our Lady of the Assumption, located in Santa Clotilde, a town on the Rio Napo in the Amazon rainforest of Peru. It has a population of about 2,000 people and serves as the capital district for about 23,000 people in 100 villages, spread over 400 km. of the Napo River and its tributaries. All transport is river water, with occasional planes. Most are native peoples who continue to live through hunting, fishing and subsistence farming. Today in the parish, Oblate Fathers Edgar Nolasco OMI, and Roberto Carrasco Rojas OMI, with the Pastoral Coordination, Apostolic Vicariate, San Jose of the Amazon, are working with Norbertine priest and medical doctor, Jack MacCarthy, O. Praem, and many lay workers and volunteers. 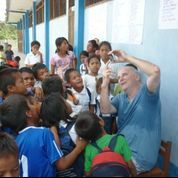 Oblates in Peru are working with children of the indigenous kichwa in the Amazon, whose communities are threatened by intensifying economic activity: oil exploration, increased illegal logging, pollution related to informal gold mining, commercial fishing operations, and the social ills that follow, including an increase in drug dealing. There is an increasing lack of teachers at all levels. Read the encouraging story of their recent RECREARTE Project. The Oblate parish in Santa Clotilde, in the Peruvian Amazon, organized a gathering of political authorities and leaders from nearly 50 communities – religious, health, education, indigenous – for a three day workshop on the upcoming elections. At the end of the meeting, a “governance” agreement was signed by all, including the candidates for the upcoming elections. In this statement, it was agreed, amongst other things, that all civil society and indigenous groups would monitor the work of whoever is ultimately elected. The agreement is the first of its kind in Peru!